We understand how upsetting it is having a sick or injured pet and not being able to get help quickly. Our emergency services are here for you 7 days a week; 24 hours a day. Staff veterinarians along with technical support staff are on premises at all times working as a team with skill and compassion to respond to emergency calls during the hours your veterinarian is unavailable. We will stabilize your pet, perform any necessary diagnostic tests and continue treatment as needed. Your pet will be in the best possible hands so you can have peace of mind. Although an appointment is not needed, we ask that you telephone the hospital to alert us to your emergency so that we can prepare properly for your pet’s arrival. Call ahead if possible; our staff is on site 24 hours a day, 7 days a week. Availability of board certified specialist for consultation when needed. 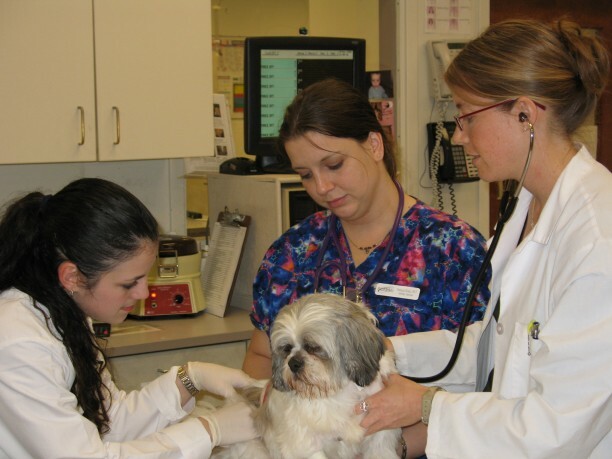 Our staff doctors confer daily on all hospitalized cases, and your pet may be under the care of more than one doctor. You may call the hospital after 10:00AM Monday through Saturday and after 1:00PM on Sunday to check on your pet’s progress. Although the doctor may be unable to receive a phone call at that time, a summary of your pet’s condition will be available from the telephone receptionist. Before any patient is admitted to the hospital (unless it is an emergency situation), we ask that all vaccines be current and that the patient be free of ticks and fleas. If these requirements are not met, we must satisfy them at the owner’s expense. This is for the protection of your pet and hospitalized patients as well. Visitation Policy: Although we realize you may be anxious to visit your pet while hospitalized, visitation is done on a case by case basis. Visitation may not be recommended in order to avoid anxiety caused expectations of going home. In some cases these visits can lead to psychological or emotional trauma in your pet. In some instances the advantage of visitation outweighs the disadvantage and your veterinarian may permit you to visit your pet. These visits must be restricted to 10 minutes in length since we do not wish your pet’s treatment schedule to be interrupted or delayed by prolonged visitation. Visitation is not available on Saturday and Sunday unless special arrangements are made between you and your doctor. A brief report will be faxed to your veterinarian when your pet is seen for emergency care. Your veterinarian will be updated through progress reports during your pet’s hospital stay as well as a detailed summary report upon discharge. Please follow up with your local veterinarian for continued care. Our technologically advanced equipment and the highly developed skills of our staff serve us in diagnosing and caring for critical and challenging cases. We are prepared to assist your veterinarian in the treatment of your ill or injured pet at any time.